Located along a good highway and close to town, the area is perfect for anyone who loves the outdoors but also likes being close to the amenities of the modern world. But some of the Pisgah Ranger District's greatest backcountry and wilderness areas lie within or adjacent to this drainage as well. The Davidson River's watershed area is bisected by US Hwy. 276 as it climbs northwest from the town of Brevard, up the valley and then the Pisgah Ridge, to the Blue Ridge Parkway, which roughly forms the northwest boundary of the area. Two mountain ridges reaching southeast from the Pisgah Ridge - Black Mountain and Pilot Mountain - form the northeast and southwest edges of the watershed, respectively, while the lower end spills out into the French Broad River valley and civilization along NC Hwy. 280 and US 64, which forms the far southeastern boundary. Looking Glass Rock - as much an icon of the area as Mt. Pisgah itself - sits right in the middle of the valley. The vast majority of people who venture into this section of the forest stick to a narrow corridor right along this major thoroughfare. As soon as one ventures off the major roads and into the woods, the hustle and bustle is soon left behind and solitude once again reigns. There are more than enough trails and gravel roads in this area to take up a day of riding, and you can most likely stay busy for several days exploring the mountains here. Trails in the Davidson River area are generally similar to those found elsewhere in the Pisgah National Forest. They are rockier, steeper, and more challenging than those at Tsali. 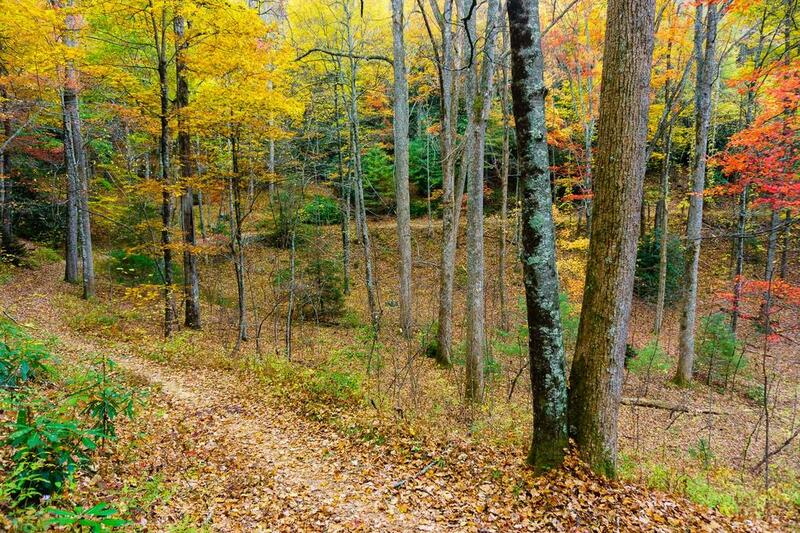 Many trails follow old road or railroad beds and have significant erosion problems. Others climb high mountain ridges and are true singletrack treads. Below is a general description of what can you'll find when driving north up US 276 from Brevard to the Blue Ridge Parkway. Points of interest are shown in red; trails are shown in bold. Numbers indicate distance in miles from the Pisgah National Forest entrance marker when driving US 276 from Brevard toward the Parkway. Starting at the intersection of US 64/NC 280, you enter the Pisgah National Forest by a dramatic stone entrance marker. The Sycamore Flats Recreation Area (0.3) is the first site you encounter. A large, flat riverside picnic area is located there with all facilities. Next you will pass the large Davidson River Campground (1.1) and the Art Loeb Trailhead on the left. The Davidson River Campground is an excellent base camp for exploration in the Davidson River area and beyond. The North Slope and Sycamore Cove (0.9) trails (both moderate loops which can be combined into a great ride in the cool season) are both accessible from this parking area. You will then pass the Pisgah Ranger District Ranger Station and Visitor Center (1.4) on the right, which offers plenty of parking, exhibits, restrooms, and a gift and book store. They carry excellent maps, and staff can provide information about the entire Pisgah National Forest. From the ranger station you can access the Andy Cove Nature Trail, the Exercise Trail, the Thrift Cove Trail, and Grass Road (all nice, easy to moderate trails) and the Black Mountain Trail (a longer, most difficult trail if taking its entire length). Fall color along the Thrift Cove trail, in the Davidson River area of the Pigah National Forest. Past the Ranger Station, FS 477 turns right into the Avery Creek valley (2.1), where there are a few interconnecting trails that are often combined to make excellent loops. These include include Bennet Gap, Buckwheat Knob, Buckhorn Gap, Avery Creek, and another stretch of Black Mountain. The Pisgah Horse Stables are also located along FS 477. 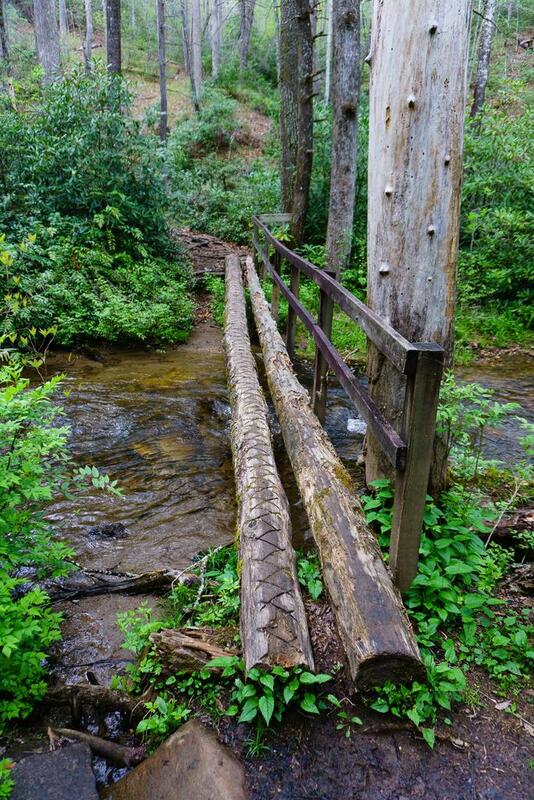 Classic Pisgah log bridge, Avery Creek trail. Further along US 276, small pull-offs with enough room for just one or two cars invite you to stop and walk into the lush woods or down to the river, and some have roadside picnic tables. You'll pass the Coontree Picnic Area (4.7) which sits next to an island and a great swimming hole in the Davidson River. It also provides access to the Coontree Loop Trail, which is open to bikes on its east side during the cool season. Just upstream of Coontree, the Davidson River and Looking Glass Creek fork apart, and the road splits as well (5.2). One fork goes on either side of the ridge formed by Looking Glass Rock. The parking lot provides access to the Cat Gap Loop (seasonal), Butter Gap (part open to bikes), and (via Butter Gap) Long Branch trails. You can also access FS 475c, which leads all the way to the Bracken Mountain trail system in Brevard, creating a long, backcountry option for riding into Pisgah from town. Continuing along FS 475 past the fish hatchery, you will find the parking areas for the Cove Creek group camping area and Cove Creek* trail. Beyond that, the road turns to gravel, passes the **Daniel Ridge, Cemetery Loop, and Long Branch trails, then exits the Davidson River area after climbing over Gloucester Gap. If you bear right on US 276 where it intersects 475, you will very quickly come to the beautiful Looking Glass Falls (5.6), one of the most scenic and most-photographed in the state. Further along is the parking area for Sliding Rock (7.7). This natural, 60-foot rock water slide ends in a deep, cold, clear pool and is an extremely popular spot for cooling off. The final point of interest to mountain bikers is the Pink Beds Picnic Area (11.4), where you can ride the north half of the Pink Beds Loop trail. Technically, the Mills River drains this valley instead of the Davidson. However, it is included in the Davidson River Area for this site since US 276 passes through it and the trailhead is so close to other trails in the Davidson River area. Past the Pink Beds, US 276 climbs to the Blue Ridge Parkway 15.1 miles beyond the entrance gate. 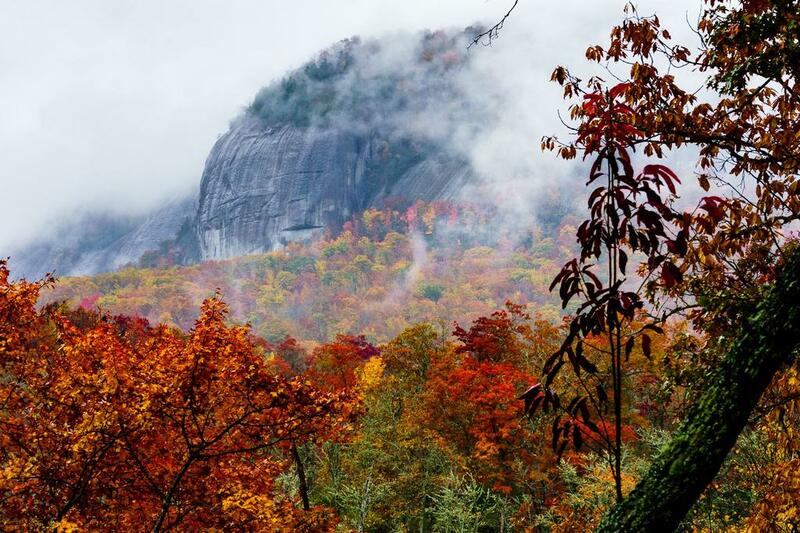 Looking Glass Rock poking out of the fog and surrounded by fall color on a rainy day. 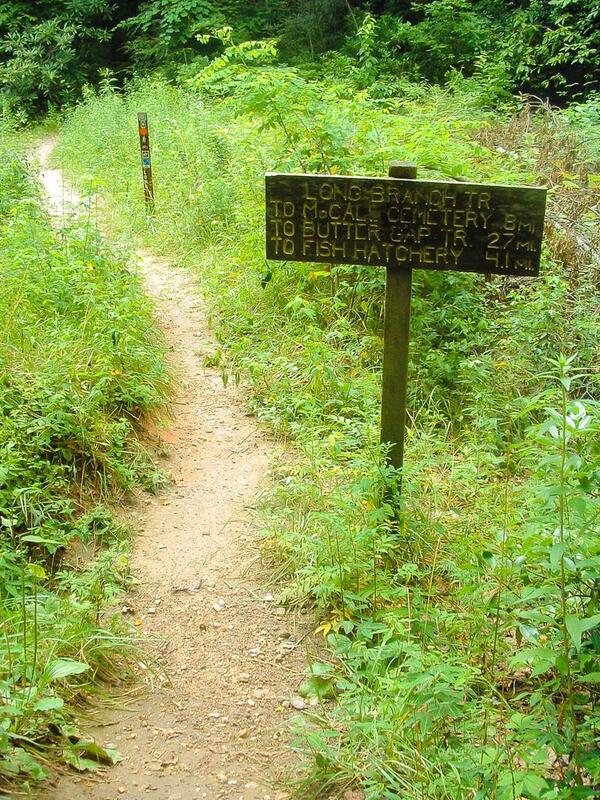 The heart of Pisgah Forest is the intersection of NC Hwy. 280, US Hwy. 64 and US Hwy. 276. The Wal-Mart and Bi-Lo Shopping Center is located at this corner, as is the Hampton Inn hotel. You will also find restaurants (Pizza Hut and my favorite: Hawg Wild BBQ at this corner, El Chapala Mexican Restaurant across the highway) and fast food here (Taco Bell) & south along US 276/64 (Arby's, McDonalds & Wendy's). Located here as well are Backcountry Outdoors outfitters & bike shop and Sycamore Cycles, with all the gear you need for your trip into the Davidson River Area! From this intersection, the Pisgah National Forest entrance gate is 100 yds. W. on US 276. Dupont State Forest via Crab Creek Rd. is 3.7 mi. E. on US 64. Asheville via I-26 is 16 mi. N. on US 280. The Holiday Inn Express hotel is 0.3 mi. S. on US 276/64. The town of Brevard is approx. 3 miles S. on US 276/64 and presents many other lodging, dining and shopping options. This area is a great hub for explorations into the Pisgah National Forest of course, but also to Dupont State Forest, Nantahala National Forest, the Blue Ridge Parkway and beyond! For more information on the town of Brevard, visit http://www.brevardnc.com/. This campground is located about a mile past the main entrance to the National Forest when coming from Brevard, on the left. It is open year-round. There are 163 sites, some of which are closed during the winter months. Fees for sites range from $20 - $40 per night. Flush toilets, hot showers, and amphitheater, and river swimming and tubing are all available here. This campground is the closest to the most trails: the seasonal North Slope trail starts right out of the campground itself, and several fun trails start across the street! 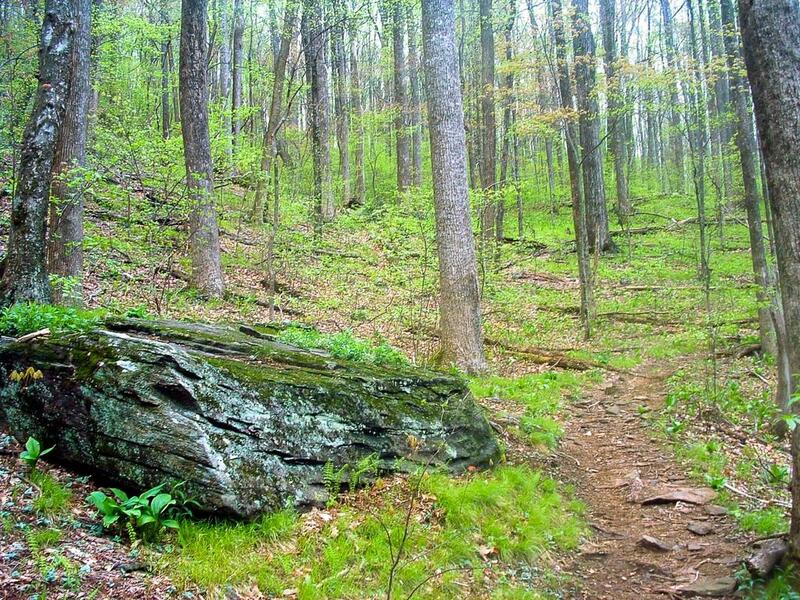 It's within a 10 minute drive of all trails in the Davidson River area. For more information and to make reservations, visit the Davidson River Campground page on Recreation.gov.